“Antarctic warming courtesy of Mr. Fix-it“ (2012-12-27). 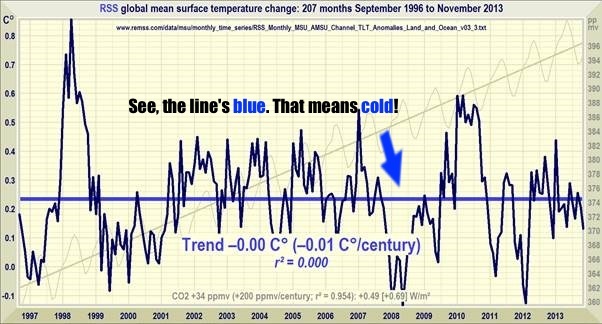 Anthony Watts posts some profound scientific analysis – “Just a little something [David Middleton] threw together”. On the basis of Middleton’s “Mk I eyeball”, careful scientific work on Western Antarctic temperature records is dismissed with a sneer as “manufactured” and denialist cooling (via squinting) replaces objective evidence of significant warming. So David, did you just “throw it together” or just throw it up? If you believe Anthony’s interested in science, you probably believe in the tooth fairy. “Dana Nuccitelli’s holiday trick for sobering up quick: put a little less rum in your egg nog” (2012-12-28). 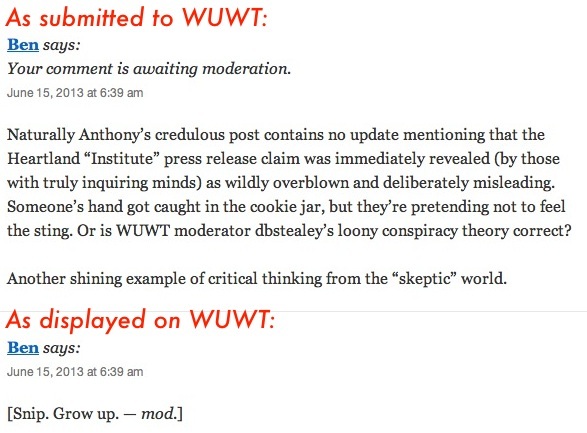 Funny how a post on Anthony Watts’ “uncensored” website attacking Dana Nuccitelli doesn’t have any responses from Dana Nuccitelli. Just sayin’. So Anthony’s denialist buddy Alec Rawls, a self-appointed whistle-blowing IPCC expert, posted this bunk to lash out at Dana Nuccitelli. Dana had the temerity to ridicule Alec’s idea that there is a lag of secret duration and unknown cause in our climate’s response to “solar variation” (which… doesn’t). Thus proving that it really is all because of the sun and we can go back to our coal-powered land yachts free from communist oppression. After-all, your level of inebriation can rise even after you stop drinking! And a wacky biological analogy is even better than a physical science proof. To be blunt, you’d know more about solar physics and climate from staring straight into the sun for a minute than Alec could figure out in a lifetime. I have to feel bad for Dana on this point. It isn’t his fault. He has been systematically duped by this parade of so-called scientists all telling him that a persistent high level of forcing can’t cause continued warming. Makes me want to put him on a milk carton. The poor guy isn’t just lost, he was kidnapped. Want a piece of candy little boy? Credulous Science indeed. The Steinhilber et al. paper you cite, ends with “The UV irradiance may not be the viable solution because its observational data do not show a similar distinct decreasing trend as TSI [Frohlich ¨ , 2009], implying that its level during the MM was similar as in present solar cycle minima. So you will quote selectively and omit what you don’t like.